The second Tiffany Aching book, A Hat Full of Sky, picks up right where the first one left off. The Lancre witches have arranged for Tiffany to learn from a witch, in something like an apprenticeship. This matches with traditions in the Chalk, Tiffany’s home region, in which girls often went “into service.” Pratchett explains, “Traditionally, you started by helping an old lady who lived by herself; she wouldn’t be able to pay much, but since this was your first job you probably weren’t worth much either.” (p. 14) There’s a pointed message for any young adult readers! Early on, Pratchett lines up elements that will be important later. Tiffany casually steps outside of herself to get a better look at herself than her farm’s meager mirror can provide. Just before Tiffany leaves to go into service the local Baron’s son, who is “a lot less of a twit than he had been” (p. 25) according to Tiffany, gives her a present to remember him and her homeland by. When she arrives at the new witch’s cottage, she sees a circus poster that, among other things, encouraged visitors to “See the egress! !” Pratchett slips a discussion of wishes into Tiffany’s musings on the Nac Mac Feegle, the formidable pictsies who have taken a liking to her, and even made her their chief for a brief while. The new chief, a proper Feegle kelda, makes her distrust of Tiffany plain early on, thus ensuring that she will be on her own — at least for a while – when unfortunate things start to happen. Which of course they do, or there wouldn’t be much of a story. 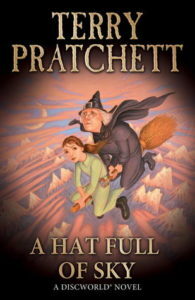 In A Hat Full of Sky, Pratchett introduces a new magical entity, called a Hiver. Even the Nac Mac Feegle are afraid of them. They are like bodiless parasites, taking over living beings and eventually consuming them. But a Hiver remembers everyone it has been, meaning that previous victims continue to exist, after a fashion. About the first third of the book ambles along, showing Tiffany’s leave-taking, and how she settles into her new home and role. Miss Level, her mentor, has a secret that Tiffany soon figures out. It had made Miss Level unwelcome where she came from. “And then … they thought I was evil,” [Miss Level] said over another shoulder. “What kind of question is that to ask anyone?” she said. They talk about the economics and ethics of being a witch — never ask for or expect payment, share what people give you, spread it around to people who need something. Tiffany asks whether you stop helping people who are too mean to give anything in return. “Granny Aching … that is, my grandmother said someone has to speak up for them as has no voices,” Tiffany volunteered after a moment. They talk a bit more about Tiffany’s grandmother, and what it means to be a witch. “How did you know that?” she said. Tiffany inflated with inherited pride. “Did she help people?” Miss Level added. But there wasn’t a person on the Chalk, from the Baron down, who didn’t owe something to Granny. And what they owed to her, she made them pay to others. She always knew who was short of a favour or two. In the silence that followed, Tiffany heard the birds singing by the road. You got a lot of birds here, but she missed the high scream of the buzzards. Tiffany also goes to a meeting of younger witches, and fits in rather badly. I hope these characters show up in future Tiffany Aching books. They don’t have a lot to do in this volume except to show that groups outside the mainstream (e.g., witches) can have social dynamics that continue to exclude some people. Minor comeuppances are earned, but mostly these other young witches could use more to do. In due course the book features a more standard plot with a danger to the protagonist, help from unexpected quarters, allies arriving in the nick of time, and a resolution that’s both unexpected and fitting. The Hiver is a suitable danger, and overcoming it both stems from Tiffany’s character as Pratchett has shown it so far and develops new aspects of it. There are lots of funny, quotable bits. Plus Granny Weatherwax turns up for the later parts of the book, when Tiffany is in greatest danger. But like Granny Aching, she makes people help themselves. And so while I adore Granny Weatherwax, I think the heart of A Hat Full of Sky is the conversation excerpted above. Filling what’s empty and emptying what’s full; paying things forward; speaking up for them as has no voices. Good witches.